This year the festival kicks off with Seattle-based Lesli Dalaba performing in a trio with Fred Frith, Jason Hoopes and a duo with special guest Gail Brand (UK) in Oakland’s intimate Studio 1510. Gail closes the festival with a performance with local Sperry collaborators Gino Robair, Morgan Guberman, John Shiurba, Tim Perkis and Tom Djll on the stage of the Maybeck-inspired Hillside Club. The festival tradition of works for large ensemble continues as OrcheSperry ascends the tall stairs of the Luggage Store Gallery to perform new works in homage to Matthew’s musical life and work, and reprise Matthew’s rollicking improv karaoke of Treasure Mouth, which requires a band to follow along to lyrics as fast as they can be written out for them by others. This year the festival features special guests John Butcher (UK) and Carla Kihlstedt (US) in two evenings of solos, duos, trios and quintets. The festival tradition of commissioning new works for large ensemble continues with a page from Matthew’s composition notebook: Treasure Mouth, which requires a band to follow along to lyrics as fast as they can be written out for them by others — call it improv karaoke. Join in the fun of Treasure Mouth at the festival’s first official Children’s Matinee. 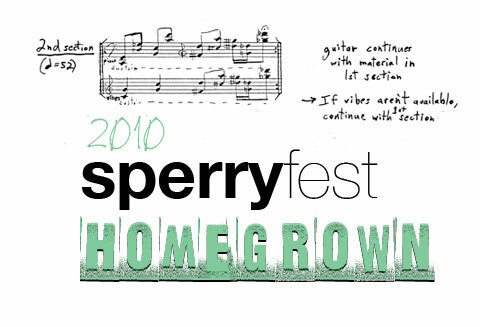 Update: Tom Duff reminds us that his recordings of all 2008 Matthew Sperry Festival events are indexed at http://4-33.com/fest/. The festival concludes with a Master Class with guest artist John Butcher. Watch this space for information on advance tickets. 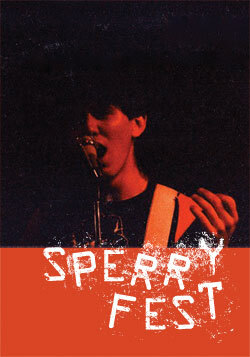 All proceeds from these benefit performances support the Matthew Sperry Memorial Fund. The Red Hot Chachkas are an eclectic Bay Area klezmer group who, once upon a time, played at Matthew and Stacia’s wedding. 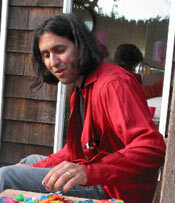 Soon after, Matthew joined the Chachkas as a basisst, and played with the group until his death. The Chachkas have written a song for Matthew: Suite Matthew. 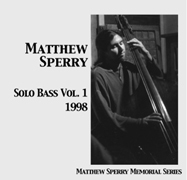 Julie Eggers wrote this song in memory of a wonderful friend, bassist Matthew Sperry. He played many types of music, including klezmer and avant-garde, and was a Red Hot Chachka for several years. He died in a tragic accident in 2003. We take this tune outside as a nod to Matthew. Festival-goers will also be able to buy the latest release of rare recordings of Matt. This year’s recording is of a concert featuring Matt with Lesli Dalaba (trumpet), Fred Frith, and Gino Robair. 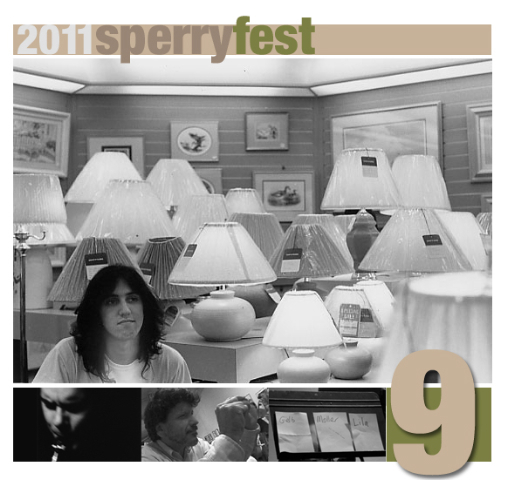 John Shiurba and Ellen Fullman will be in the studio with Nozmo, playing SperryMusic and talking about the Festival, with special guest live performances TBA and ticket giveaways. 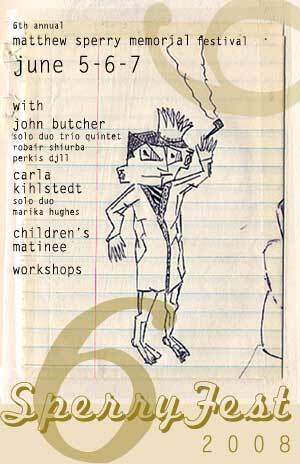 Thanks to Other Minds, KFJC and KUSF for their support of the Festival. This year the festival features special guests drawn from Matthew’s personal circle of all-stars: Sean Meehan (NY) and Ellen Fullman (CA). These musicians who inspired Matthew and his music will perform over two nights, in both experimental gallery and intimate studio settings, in both solo sets and small ensembles, in a musical journey of remembrance and reunion. The festival tradition of commissioning new works for large ensemble continues with The Enormous Quartet, where a creative cloud of Bay Area musicians will perform in spontaneous combinations of four. Advance reservations are required for Sunday performance; click here to reserve. Note: If you previously reserved a seat for the Casa Ninja performance, please RE-RESERVE. Due to an email delivery problem, your original reservation submission was lost. We apologize for the inconvenience. it’s amazing to me that so many amazing artists show up for no other reason than to contribute to a sense of community and higher purpose; to pay tribute to not only matthew but to what it means to make art in a communal way. i know matthew would have loved that. this is the most clear and obvious demonstration of the fact that art and music can connect human beings and their communities to the upper partials of existence on this planet, and perhaps beyond. i know that i did my best as one of the organizers of the festival, to foster an atmosphere of appreciation and respect for each player, and to acknowledge the fact that the music of each of the participants expresses some meaning, the elucidation of which lies well beyond my capacity. my reflection on matthew’s life and work and life-force has inspired in me something beyond the obvious need to strive to be a better musician, namely to strive to be a better member of the community. in that sense i feel this year’s festival was a true success. and of course the music was incredible.